Tips for partnering with managed care organizations, plus cost-saving strategies. Stephanie Holliday, PharmD, discusses REMS, self-administered oral chemotherapy and other hot topics in specialty pharmacy. Aetna Specialty Pharmacy, other providers offer drug adherence strategies. N. Lois Adams, BPharm, on reining in the high cost of drug therapy. Patient assistance programs, plus a projection that specialty pharmacy drug spending will soar by 26.5% in 2012. University of Illinois clinical staff pharmacist Nehrin Khamo, PharmD, educates a patient on self-injection techniques. hings have been heating up on the IV nutrition shortage front. Last fall, Baxter hosted the first-ever nutrition shortage safety summit, and the American Society for Parenteral and Enteral Nutrition (A.S.P.E.N. ), which put together a task force to address the supply shortages, has been issuing frequent updates and guidances to help its members prioritize, substitute and manage the limited supplies they have. But such regulatory and policy efforts only go so far in mitigating the effects of the shortage on patient care. Here are several practical strategies that home infusion centers are using right now to weather the storm. Kalydeco approved for cystic fibrosis patients with CFR gene mutation. Important Safety Information for GAMUNEX-C Gamunex-C, Immune Globulin Injection (Human), 10% Caprylate/Chromatography Puriﬁed, is indicated for the treatment of primary humoral immunodeﬁciency disease (PI), idiopathic thrombocytopenic purpura (ITP), and chronic inﬂammatory demyelinating polyneuropathy (CIDP). Renal dysfunction, acute renal failure, osmotic nephrosis, and death may occur with immune globulin intravenous (IGIV) products in predisposed patients. Patients predisposed to renal dysfunction include those with any degree of pre-existing renal insufﬁciency, diabetes mellitus, age greater than 65, volume depletion, sepsis, paraproteinemia, or patients receiving known nephrotoxic drugs. Renal dysfunction and acute renal failure occur more commonly in patients receiving IGIV products containing sucrose. Gamunex-C does not contain sucrose. For patients at risk of renal dysfunction or failure, administer Gamunex-C at the minimum concentration available and the minimum infusion rate practicable. Gamunex-C is contraindicated in individuals with acute severe hypersensitivity reactions to Immune Globulin (Human). It is contraindicated in IgA deﬁcient patients with antibodies against IgA and history of hypersensitivity. Gamunex-C is not approved for subcutaneous use in patients with ITP or CIDP. Due to the potential risk of hematoma formation, Gamunex-C should not be administered subcutaneously in patients with ITP. Hyperproteinemia, increased serum viscosity, and hyponatremia may occur in patients receiving IGIV therapy. Thrombotic events have been reported in association with IGIV. Patients at risk for thrombotic events may include those with a history of atherosclerosis, multiple cardiovascular risk factors, advanced age, impaired cardiac output, coagulation disorders, prolonged periods of immobilization and/or known or suspected hyperviscosity. There have been reports of noncardiogenic pulmonary edema [Transfusion-Related Lung Injury (TRALI)], hemolytic anemia, and aseptic meningitis in patients administered with IGIV. The high dose regimen (1g/kg x 1-2 days) is not recommended for individuals with expanded ﬂuid volumes or where ﬂuid volume may be a concern. Gamunex-C is made from human plasma. Because this product is made from human plasma, it may carry a risk of transmitting infectious agents, e.g., viruses, and, theoretically, the Creutzfeldt-Jakob disease (CJD) agent. After infusion of IgG, the transitory rise of the various passively transferred antibodies in the patient’s blood may yield positive serological testing results, with the potential for misleading interpretation. In clinical studies, the most common adverse reactions with Gamunex-C were headache, fever, chills, hypertension, rash, nausea, and asthenia (in CIDP); headache, cough, injection site reaction, nausea, pharyngitis, and urticaria with intravenous use (in PI) and infusion site reactions, headache, fatigue, arthralgia and pyrexia with subcutaneous use (in PI); and headache, vomiting, fever, nausea, back pain, and rash (in ITP). The most serious adverse reactions in clinical studies were pulmonary embolism (PE) in one subject with a history of PE (in CIDP), an exacerbation of autoimmune pure red cell aplasia in one subject (in PI), and myocarditis in one subject that occurred 50 days post-study drug infusion and was not considered drug related (in ITP). *CIDP=Chronic inﬂammatory demyelinating polyneuropathy; PI=Primary immunodeﬁciency; ITP=Idiopathic thrombocytopenic purpura. Reference: 1. Data on ﬁle, Grifols. You are encouraged to report negative side effects of prescription drugs to the FDA. Visit www.fda.gov/medwatch, or call 1-800-FDA-1088. Please see adjacent page for brief summary of GAMUNEX- C full Prescribing Information. • Thrombotic events have occurred in patients receiving IGIV therapy. Monitor patients with known risk factors for thrombotic events; consider baseline assessment of blood viscosity for those at risk of hyperviscosity. • Aseptic Meningitis Syndrome (AMS) has been reported with GAMUNEX-C and other IGIV treatments, especially with high doses or rapid infusion. HIGHLIGHTS OF PRESCRIBING INFORMATION These highlights do not include all the information needed to • Hemolytic anemia can develop subsequent to IGIV therapy due use GAMUNEX®-C safely and effectively. See full prescribing to enhanced RBC sequestration. Monitor patients for hemolysis information for GAMUNEX-C. and hemolytic anemia. GAMUNEX-C, [Immune Globulin Injection (Human) 10% • Monitor patients for pulmonary adverse reactions (transfusionCaprylate/Chromatography Puriﬁed] related acute lung injury [TRALI]). Initial U.S. Approval: 2003 • Volume overload WARNING: ACUTE RENAL DYSFUNCTION and FAILURE See full prescribing information for complete boxed warning. • Renal dysfunction, acute renal failure, osmotic nephrosis, and death may occur with immune globulin intravenous (IGIV) products in predisposed patients. • Renal dysfunction and acute renal failure occur more commonly in patients receiving IGIV products containing sucrose. GAMUNEX-C does not contain sucrose. • For patients at risk of renal dysfunction or failure, administer GAMUNEX-C at the minimum concentration available and the minimum infusion rate practicable. • GAMUNEX-C is made from human plasma and may contain infectious agents, e.g., viruses and, theoretically, the Creutzfeldt-Jakob disease agent. • Passive transfer of antibodies may confound serologic testing. ----------------------------ADVERSE REACTIONS---------------------------• PI – The most common adverse reactions (ⱖ5%) with intravenous use of GAMUNEX-C were headache, cough, injection site reaction, nausea, pharyngitis and urticaria. The most common adverse reactions (ⱖ5%) with subcutaneous use of GAMUNEX-C were infusion site reactions, headache, fatigue, arthralgia and pyrexia. To report SUSPECTED ADVERSE REACTIONS, contact Talecris Biotherapeutics, Inc. at 1-800-520-2807 or FDA at 1-800-FDA-1088 or www.fda.gov/medwatch. ----------------------------CONTRAINDICATIONS-------------------------------------------------------DRUG INTERACTIONS---------------------------• Anaphylactic or severe systemic reactions to human • The passive transfer of antibodies may transiently interfere with immunoglobulin the response to live viral vaccines, such as measles, mumps • IgA deﬁcient patients with antibodies against IgA and a history and rubella. Passive transfer of antibodies may confound of hypersensitivity serologic testing. ---------------------WARNINGS AND PRECAUTIONS--------------------• IgA deﬁcient patients with antibodies against IgA are at greater risk of developing severe hypersensitivity and anaphylactic reactions. Have epinephrine available immediately to treat any acute severe hypersensitivity reactions. • Monitor renal function, including blood urea nitrogen, serum creatinine, and urine output in patients at risk of developing acute renal failure. • GAMUNEX-C is not approved for subcutaneous use in ITP patients. Due to a potential risk of hematoma formation, do not administer GAMUNEX-C subcutaneously in patients with ITP. • Hyperproteinemia, with resultant changes in serum viscosity and electrolyte imbalances may occur in patients receiving IGIV therapy. --------------------USE IN SPECIFIC POPULATIONS -------------------• Pregnancy: no human or animal data. Use only if clearly needed. • Geriatric: In patients over 65 years of age do not exceed the recommended dose, and infuse GAMUNEX-C at the minimum infusion rate practicable. : What strategies would work for a small specialty pharmacy looking to partner with a managed care organization (MCO)? pharmacists have the clinical skills to help keep patients healthy and at home.” Which brings us to our raison d’être as a publication. Our editorial mission— bridging the gap between the hospital and home—focuses squarely on continuity of care efforts. Interestingly, every segment of the specialty pharmacy market quoted in this issue, including hospitals, specialty/home infusion providers and managed care groups, claim they provide the best continuity of care. In some cases, they even challenge their competitor’s ability to do so. But our role as a new publication is not to take sides. Our mission instead is to give each market segment the opportunity to make a case for how it brings value to the provision and management of specialty pharmaceuticals. Do we have a strong link to health systems? 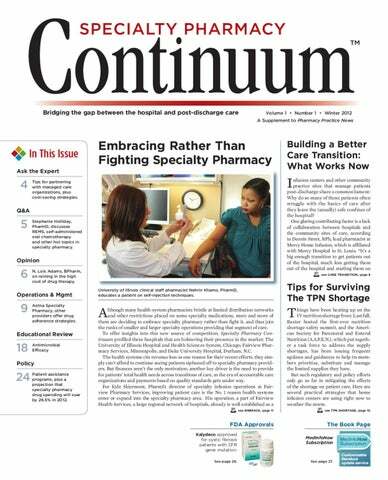 Of course—we’ve been publishing Pharmacy Practice News, a sister publication to Specialty Pharmacy Continuum, for more than 30 years. But there is a reason why PPN is perennially ranked No. 1 in readership by independent auditors: our ability to report the news and practice management trends in a fair, hard-hitting, unbiased fashion, without favor to any one segment of our audience. We look forward to applying that successful formula—with help from you, the reader—in the specialty pharmacy market. Give us a call or drop us an email at spceditor@mcmahonmed.com: We’d love to hear your thoughts on how we can best meet the information needs of this dynamic group of providers. could establish an early patient discharge program to expedite the transfer of patients receiving specialty medications in the hospital setting to a more cost-effective location (e.g., at home or your ambulatory infusion suite). Another strategy is to track emergency room avoidance based on your clinical interventions and, on a quarterly basis, present the data and cost-savings to key leadership at the MCO. Finally, there are many medications that are dosed based on the patient’s weight. In the case of hemophilia drugs, the standard is to treat patients to within 10% of the calculated prescribed dose. By matching our goal to be within 2% of the calculated dose, you could achieve significant savings and present those savings to MCO leadership. This will give you instant credibility and an opportunity to expand your partnership. Sales, Production and Editorial Offices: 545 West 45th Street, 8th Floor, New York, NY 10036. Telephone: (212) 957-5300. A family-owned medical publishing and medical education company. McMahon publishes seven clinical newspapers and several annual or semiannual Special Editions. Copyright © 2012 McMahon Publishing, New York, NY 10036. All rights reserved. Specialty Pharmacy Continuum (ISSN 0886-988x) is published quarterly by McMahon Publishing. Periodicals postage paid at New York, NY, and at additional mailing offices. POSTMASTER: Send address changes to Pharmacy Practice News, Circulation Dept., 545 W. 45th St., 8th Floor, New York, NY 10036.
medical professionals with essential, up-to-date news. 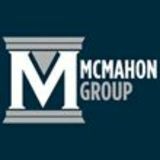 As the second largest publisher of medical newspapers, McMahon produces Anesthesiology News, Clinical Oncology News, Gastroenterology & Endoscopy News, General Surgery News, Infectious Disease Special Edition, Pain Medicine News, Pharmacy Practice News and Rheumatology Practice News. Editor’s note: Dr. Holliday also serves as a clinical consultant for the Center for Minority Studies, Inc., a pharmacist-run nonprofit organization dedicated to increasing health literacy and health awareness among people living with HIV/AIDS in the Washington, DC. form of increased insurance premiums, co-pays, etc. There also are some additional consequences of overdispensing. These medication can get into the hands of young people who can become harmed or addicted. Also, because some patients flush their unused drugs down the toilet or pour them down the drain, these drugs can contaminate our drinking water supply and the water supply for our wildlife. Surely, a purported slight savings in dispensing fees cannot compensate for the actual drug costs as well as the costs of these unintended effects. We have seen the cost of health care escalate to an almost unaffordable level, due in part to drug waste and price escalation. Pharmacists must look for ways they can help to reduce these costs by being innovative and creative with the knowledge that they have, while at the same time enhance the health outcomes of their patients. Patients should have the option to obtain their prescription medications from a pharmacist whom they know and trust—one who knows the variables that come into play in getting the particular patient well and who understands why a “high-touch” approach is so important in the care of patients with chronic, complex illnesses. Ms. Adams, a member of Specialty Pharmacy Continuum’s editorial advisory board, welcomes your feedback at nloisadams@hhcs.com. 3 million prescription errors each year. Put another way, there could be approximately one prescription error committed every week in every pharmacy in the United States. That’s just not an acceptable metric when one considers our profession’s primary goal: to help ensure the safe and effective delivery of medication therapy to all of our patients. Technology certainly offers a partial solution. Many pharmacies, for example, have used bar coding, clinical decision support and computerized prescriber order entry to prevent mistakes, but there are still many pharmacies without these expensive technologies. and cost savings to make pharmacy business operations sustainable when the American public has one of the highest rates of uninsured populations in history. Ms. Kunzendorf, a member of Specialty Pharmacy Continuum’s editorial advisory board, welcomes your feedback at ckunzendor@aol.com. Dull needles can cause pain, redness, needle site irritation, and longer healing times. A sharp, high-quality needle is no needl accident! accid nt! We manufacture in our own facility to ensure consistent quality − including the use of a high-resolution X-ray real time inspection system as part of our in-depth quality program. SCIg infusion problems? . . . it could be the needles. Despite all of these challenges, our focus must remain on the patient and ensuring connectivity across the spectrum of health care. That continuum of care is the only option to effectively and efficiently manage each patient’s care for the future. I am confident that the pharmacy profession can make those connections. Consistently high needle quality means fewer infusion complications, greater patient satisfaction, less nursing time, and lower costs. home infusion therapy,” Mr. Street said. “A poorly coordinated transition to home care can result in missed [medication] doses and lack of compliance”—a recipe for hospital readmission, he stressed. For Mr. Street, the drug regimens primarily affected are not specialty medications; rather, they are the usual staples of home infusion centers, such as IV antibiotics. But on occasion when specialty medications are involved, he noted, helping patients understand their regimens via stronger outreach and transition-of-care efforts can be critical, given the high-risk nature of the drugs. Regardless of the type of drug or disease state involved, before a patient is discharged, one of Mr. Street’s staff members visits the patient in his or her room to discuss what to expect from home infusion services and what’s expected of the patient post-discharge, as well as to emphasize the importance of completing the entire infusion schedule. “Once patients understand the process, it’s easier for them to follow through at home. We want them to feel comfortable and not get scared off or [have to go] back into the hospital because they’re not involved enough in the process,” Mr. Street added. The staff also coordinates the logistics and bureaucratic tasks—an equally important aspect of continuity of care. They verify insurance, consult with social workers and discharge coordinators, schedule home visits, prepare prescribed drugs and deliver them to patients’ homes or to providers when needed. able to connect with a primary care provider, whichever comes first,” she said. What Hospitals Are Doing Hospitals have their own set of challenges when it comes to preparing patients for their transition home. Poor medication reconciliation, inadequate discharge planning and a lack of patient outreach post-discharge are just a few of the roadblocks that can lead to poor outcomes (Ann Intern Med 2003;138:161167). Fortunately, these transition challenges are being addressed by innovative hospitals. Pharmacists at Geisinger Health System, Danville, Pa., for example, established a system in which clinical pharmacists participate in team rounds. Each morning before clinical rounds, the head nurse, inpatient physician, social worker or care manager and clinical pharmacist convene to review the status of every patient on the floor. The physician leads the meeting and updates target discharge dates for each patient. That information is key to facilitating successful pre-discharge activities such as patient education about their medications and arranging post-discharge care, noted Angela Slampak-Cindric, PharmD, a clinical pharmacist at Geisinger. “Knowing when a patient will go home turned out to be very important,” she said “because it provides a baseline from which nurses and pharmacists can prepare patients prior to their departure.” If, for example, the pharmacist identifies a patient who will require IV antibiotics after discharge, the pharmacist will contact a home infusion center and request that the appropriate medications be prepared and that home visits be scheduled. The pharmacist also can coordinate orders to switch from IV to oral dosing. For patients who require anticoagulants, the pharmacist will alert the anticoagulation clinic of needed followup appointments; patients new to anticoagulant therapy receive pre-discharge bedside education. The same level of follow-up occurs for patients starting antiplatelet agents and for those prescribed five or more post-discharge drugs. The program, which began in June 2009 on one inpatient unit, has since expanded to include eight units. the future. The hard part is that the motivation has to come from within.” Aetna reports adherence rates ranging from 93.4% to 97.4% for eight different disease states that it tracks in its specialty division. Aetna does not routinely track hospitalizations related to nonadherence, but it does periodically conduct studies to examine the impact of nonadherence on patient care and the causes of hospital readmissions. Jay Bryant-Wimp, RPh, co-owner and CEO of Accurate Rx Pharmacy, in Columbia, Mo., chafes at the practice of using the amount of medication dispensed over a given time period as a proxy for adherence, as Aetna and other large pharmacy benefits managers do. “It’s great to recognize that there’s medicine going out from the pharmacy, but collecting data on how well patients are getting refills isn’t enough,” he said. “If you’re not looking at factors such as hospitalization based on nonadherence, you don’t have a complete picture.” Mr. Bryant-Wimp’s company maintains a scoreboard to keep track of events, such as hospitalizations and emergency room visits related to a patient’s diagnosis. Keeping up with patients by phone is essential to maximize adherence and optimize care, he added. However, he said, calls are best suited for screening for underlying problems that can be followed by a home visit for additional assessment or teaching. Additionally, problems such as inappropriate use of a drug or unexpected side effects are more likely to be caught during a personal visit. Mr. Bryant-Wimp expressed concern that “as an industry, specialty pharmacy is more and more about getting medications out to the home, regardless of whether or not there is a real connection with the patient.” He emphasized that continued adherence and optimal outcomes hinge on “establishing relationships and visiting patients in their homes, especially if it’s only the first or second time they receive their medications.” Ms. Adams agreed. “It’s about more than just the patients getting medicine; it’s about the relationships you have with the patients. We have to get to know these people and encourage them.” —Steve Frandzel Ms. Adams, Mr. Street and Mr. Bryant-Wimp reported no relevant conflicts of interest. Dr. Pezalla has a financial relationship with Aetna. Stay informed. Infusion pharmacists agree that keeping up with the shortage has become almost a full-time job. “At times, we’ve been changing formulas almost daily because that’s how often supplies change,” Dr. Fasnacht said. “The wholesaler won’t let you know supplies are short until they’re out. You have to stay on top of supplies with everyone every day.” Dr. Fasnacht urges home infusion pharmacists to sign up for the FDA’s drug shortage emails (www.fda. gov/drug/drugsafety/drugshortages/ default.html) and monitor on a daily basis the National Home Infusion Association’s member-only message boards (www.nhia.org), where they can also download the mp3 of a recent membership forum call on managing the impact of the drug shortage crisis. University of Illinois clinical staff pharmacists Kyle Mork, PharmD and Phyllis Lin, PharmD, prepare a medication order for temperature-sensitive shipping. lthough more health systems are taking steps to beef up their specialty pharmaceutical capacity, few match the full service lines offered by national specialty pharmacy providers like Accredo, CVS Caremark and CuraScript. Fairview Pharmacy Services in Minneapolis is one of them. Launched more than a decade ago as a convenience to Fairview Health Services’ patients and providers, Fairview’s specialty pharmacy has since extended its offerings to a far larger population, with deliveries that reach patients in all 50 states. Kyle Skiermont, PharmD, director of specialty infusion operations at Fairview Health Services, said the specialty pharmacy has had success in gaining insurer contracts by emphasizing its connection to the large network of hospitals, clinics and physician group practices maintained by its parent, Fairview Health Services, which was recently named one of 32 organizations to participate in Centers for Medicare & Medicaid Services’ Pioneer Accountable Care Organization program. University of Illinois Hospital and Health Sciences System clinical staff pharmacist Nehrin Khamo, PharmD, consults with gastroenterologist Vijay Khiani, MD. Year of Operation Among the reasons for that loss to outside pharmacies are restrictive payer contracts, limited access to specialty medications by an outpatient pharmacy, as well as inadequate specialty pharmacy capabilities. At the 2011 American Society of Health-System Pharmacists Midyear Clinical Meeting, Ms. Stubbings and colleague Juliana Chan, PharmD, described how their 491-bed hospital overcame many of these challenges, improved coordination of care and increased revenue from specialty pharmaceuticals through an outpatient specialty pharmacy clinical practice model that is now being formalized and expanded into an even larger effort. In the first phase of the practice mode, the hospital assigned two full-timeequivalent clinical pharmacists to four outpatient specialty clinics, starting with the liver clinic in 2003 (followed by gastroenterology in 2007, rheumatology in 2008, and multiple sclerosis in 2010). Their responsibilities included reviewing the therapeutic appropriateness of prescribed specialty medications for the medical condition in question; completing the prior-authorization process; providing patient education about adverse drug effects and drug self-administration of injectable agents; and monitoring for laboratory abnormalities and adverse effects. If applicable, the pharmacist also managed the risk evaluation and mitigation strategies (REMS) program for a specialty medication. The pharmacist also provided patients with a list of pharmacies where they could fill their prescriptions. If a patient chose the on-site pharmacy, the prescription was referred to the outpatient specialty pharmacy staff. The drug could be picked up by the patient or the clinical pharmacist, who then delivered it to the clinic during the patient’s appointment. Refills were picked up by the patient or mailed to the patient’s home. Figure. Financial impact of adding specialty pharmacy services at University of Illinois. pharmacy dispensed 191 specialty prescriptions from the four specialty clinics, representing $203,909 in revenue. In 2011, the pharmacy dispensed 1,656 specialty prescriptions, representing annualized revenue of $3,665,546. Every time the model was implemented for a particular clinic, related prescriptions dispensed by the on-site pharmacy increased. For example, in the year subsequent to the program’s initiation in the liver clinic, the number of related prescriptions dispensed increased to 383, compared with 35 the previous year. In the multiple sclerosis clinic, the number of prescriptions dispensed increased from 84 to 207 in a comparable time period. Similarly impressive gains were reported for biological agents prescribed in the gastroenterology and rheumatology clinics: from 155 to 360 in 2008, then to 670 in 2009. “The process is complex and time-consuming,” Ms. Stubbings said, “but the face-to-face contact between the clinical pharmacists and patients is very important to making this type of program work. Pharmacy presence and collaboration with health care providers in the specialty clinics is the key to success.” This type of program reaps benefits beyond the economic gains, noted Ms. Stubbings. Hospital-based specialty programs can address some of the problems inherent in specialty pharmacy—patients getting fragmented care that is difficult to coordinate and getting medications from multiple pharmacies that don’t have access to their medical records. She said that wanting to improve this aspect of patient care is what drove University of Illinois to get into the specialty arena. lthough the push by health systems to get a share of the specialty pharmacy market is a significant trend, they are up against stiff competition. National scale, rigorous quality controls, cost-saving efficiencies and a focus on patient care are some of the attributes that large commercial specialty pharmaceutical providers like CVS Caremark and Medco’s Accredo say have allowed them to gain a large share of the specialty pharmacy market. Years of experience in the business have also helped, they say. CVS Caremark, for example, was “one of the pioneers in the specialty space” some 30 years ago when the company’s Caremark division—at that time a separate corporate entity—began to manage the distribution of hemophilia clotting-factor products, said Randy Falkenrath, the company’s senior vice president of specialty pharmacy. Richard Faris, PhD, vice president at Accredo, Medco Health Solutions, Inc.’s specialty subsidiary, said that Medco has been involved in the specialty business ever since “these types of medications were introduced,” adding that “management and service levels were taken to new levels in 2004 when [Medco] began a strategic partnership with Accredo Health.” Medco acquired Accredo in 2005.
he U.S. specialty pharmaceutical market is poised for significant growth over the next few years, with rates likely to double those of traditional pharmaceuticals, according to the Center for Healthcare Supply Chain Research, a not-for-profit arm of the Healthcare Distribution Management Association (HDMA). The center has been keeping an eye on the specialty market since 2009, when it produced the first edition of “Specialty Pharmaceutical Facts, Figures and Trends,” according to Karen Ribler, executive vice president and chief operating officer of HDMA’s Research and Education Foundation. The newest report, released in 2011, is chock full of data on the specialty segment, ranging from market characteristics to dispensing and administration information to anticipated growth rates in specific therapeutic categories. Both seasoned and new alternatesite infusion professionals alike will further their capacity to achieve business success, while providing highquality in fusion therapy to the full spectrum of homebased patients, by engaging in our comprehensive content offerings and the vast NHIA Exposition! UTILIZE UNPARALLELED LEARNING OPPORTUNITIESâ&#x20AC;Ś The 2012 NHIA Annual Conference encompasses three general sessions, four robust tracks of numerous concurrent education options, two roundtable programs dedicated to over 25 diverse alternatesite discussion topics, multiple ontarget symposia, four fullday comprehensive industry workshops, in novative poster sessions, indispensible accreditation updates, and nearly 100 knowledgeable exhibitorsâ&#x20AC;&#x201D;as well as the strategically driven executive pre conferenceâ&#x20AC;&#x201D;all focusing upon our fieldâ&#x20AC;&#x2122;s most significant areas for risk, growth and success! â&#x20AC;&#x153;NHIA 2012â&#x20AC;? is distinctly designed for each and every team memberâ&#x20AC;&#x201D;chief executives, owners, pharmacists (and residents), nurses, senior team members, management personnel, pharmacy technicians, dietitians, other clinical staff, marketing and sales professionals, reimbursement specialists, professors, students, consultantsâ&#x20AC;Śand many more! ATTAIN VITAL CONTINUING EDUCATION CREDITâ&#x20AC;Ś Earn up to 28.5 pharmacy and nursing continuing education credit contact hours (and, back again in 2012, there are 5 CRNIÂŽ Recertification Units also avail able)â&#x20AC;&#x201D;please visit: www.nhia.org/ac12/ce for complete continuing education information and educational objectives. TRANSCENDING ALTERNATE-SITE UNCERTAINTY, TOGETHERâ&#x20AC;Ś Actively engage in reciprocal fellowship opportunities to network, strategize and collaborate with both friends and colleaguesâ&#x20AC;&#x201D;as we all partner au thentically to better define and communicate our industry value and ensure enduring success for our patients, our businesses and our field! Whatâ&#x20AC;&#x2122;s at the Heart of Effectively Transcending Our Alternate-Site Uncertaintiesâ&#x20AC;&#x201D; and Empowering Ourselves to Superbly Soar? be given in conjunction with IFN and RBV, and the treatment duration varies. For black patients, therapy usually lasts a full 48 weeks, and in clinical trials, only 30% of black patients achieved an SVR with 28 weeks of therapy. Moreover, among black patients in the Phase III trials, SVR rates fell short of the 75% that the patient expected, and in treatment-naive blacks, only 62% of those taking telaprevir (Incivek, Vertex) and 53% of those taking boceprevir (Victrelis, Schering-Plough) achieved an SVR. mon among patients with HCV infection who, after years of waiting for better therapies, are eager to try treatment with the new DAAs, said Dr. Muir, clinical director of hepatology at Duke University Medical Center, Durham, N.C. But, the DAAs on the market today are complex, with varied stoppage rules, monitoring points and some serious adverse events and drug–drug interactions. In a presentation at the 2011 annual meeting of the American Association for the Study of Liver Diseases, Dr. Muir stressed that for patients to achieve optimal benefits from DAA therapy, they need to be prepared through clear, detailed discussions prior to and throughout treatment. “The major challenges are preparing patients for the rigors of therapy, checking in frequently to make decisions about the duration of treatment and managing any issues as the patient goes along,” he said. References 1. Agency for Healthcare Research and Quality AHRQ Effective Health Care Program. Comparative effectiveness of hepatitis C treatment adherence interventions. http://www.effectivehealthcare.ahrq.gov/index.cfm/search-for-guides-reviews-and-reports/?pageaction= displayproduct&productid=839. Accessed January 18, 2012. 2. Stern D, Reissman D. Specialty pharmacy cost management strategies of private health care payers. J Manag Care Pharm. 2006;12(9):736-744. http://www.amcp.org/data/jmcp/736-744.pdf. be eligible for investigational studies, which are ongoing. —Christina Frangou Dr. Muir disclosed that he has relationships with Abbott, Anadys, Bristol-Myers Squibb, Gilead, Medtronic, Merck, Pfizer, Roche, Santaris, Scynexis and Vertex. Dr. Chung receives grant/research support from Gilead, Merck, Pfizer and Romark. Dr. Davis is a consultant for Vertex and receives grant/research support from Abbott, Boehringer Ingelheim, Bristol-Myers Squibb, Genentech, Gilead, Novartis, Pharmassett, Tibotec and Vertex. of the infecting organism is known. Because the en noted early initiation of appropriate therapy has been ctions, empiric to improve clinical outcomes for serious infections, therapy frequently demands broad-spectrum antimicrobial agent(s) until the specific infecting bacterium has been identified. Given the continuing concerns of increasing antimicrobial resistance among grampositive and gram-negative bacteria and the lack of new antibiotics coming to market, knowledge of microbiologic activity and clinical treatment guidelines increases the likelihood of providing appropriate antimicrobial therapy to patients and minimizes the use of unnecessary agents. Importantly, antimicrobial susceptibilities can be highly variable based on institution-specific and geographic factors (including various institutional sites—eg, outpatient vs inpatient, intensive care unit vs ward). Therefore, an awareness of local susceptibility data is essential to ensure the highest probability of successful clinical outcomes. While the use of various dosing techniques, especially for β-lactams, may potentiate in vivo activity, the information contained herein pertains only to standard dosing regimens. This review reflects the opinions of the authors and is intended to be a general guide to antimicrobial applications, with the appreciation that host factors (eg, site of infection, clinical picture, comorbid conditions) can greatly impact antimicrobial selection. First-line agent based on clinical efficacy, susceptibility patterns, and consideration of antimicrobial stewardship and the cost of care. Indicates an alternative drug based on clinical efficacy and susceptibility patterns. Indicates a drug with a low level of activity against this organism, and/or limited clinical efficacy. Either there is insufficient clinical data or this drug should not be used for this organism. Gordon KA, Biedenbach DJ, Jones RN. Comparison of Streptococcus pneumoniae and Haemophilus influenzae susceptibilities from community-acquired respiratory tract infections and hospitalized patients with pneumonia: fiveyear results for the SENTRY Antimicrobial Surveillance Program. Diagn Microbiol Infect Dis. 2003;46(4):285-289. Hansen GT, Blondeau JM. Comparison of the minimum inhibitory, mutant prevention and minimum bactericidal concentrations of ciprofloxacin, levofloxacin and garenoxacin against enteric gram-negative urinary tract infection pathogens. J Chemother. 2005;17(5):484-492. Kuti JL, Florea NR, Nightingale CH, Nicolau DP. Pharmacodynamics of meropenem and imipenem against Enterobacteriaceae, Acinetobacter baumannii, and Pseudomonas aeruginosa. Pharmacotherapy. 2004;24(1):8-15. Liu C, Bayer A, Cosgrove SE, et al. Clinical practice guidelines by the Infectious Diseases Society of North America for the treatment of methicillin-resistant Staphylococcus aureus infections in adults and children. Clin Infect Dis. 2011;52:e18-e55. Martin SI, Kaye KM. Beta-lactam antibiotics: newer formulations and newer agents. Infect Dis Clin North Am. 2004;18(3):603-619. Paterson DL, Bonomo RA. Extended-spectrum beta-lactamases: a clinical update. Clin Microb Rev. 2005;18(4):657-686. Petersen PJ, Bradford PA, Weiss WJ, Murphy TM, Sum PE, Projan SJ. In vitro and in vivo activities of tigecycline (GAR-936), daptomycin, and comparative antimicrobial agents against glycopeptide-intermediate Staphylococcus aureus and other resistant gram-positive pathogens. Antimicrob Agents Chemother. 2002;46(4):2595-2601. Rhomberg PR, Fritsche TR, Sader HS, Jones RN. Comparative antimicrobial potency of meropenem tested against gram-negative bacilli: report from the MYSTIC surveillance program in the United States (2004). J Chemother. 2005;17(8):459-469. Rice LB. Antimicrobial resistance in gram-positive bacteria. Am J Med. 2006;119(6 suppl 1):S11-S19; discussion S62-S70. Ferrara AM. Potentially multidrug-resistant nonfermentative gram-negative pathogens causing nosocomial pneumonia. Int J Antimicrob Agents. 2006;27(3):183-195. Nordmann P, Cuzon G, Naas T. The real threat of Klebsiella pneumoniae carbapenemase producing bacteria. Lancet Infect Dis. 2009;9(4):228-236. Curran M, Simpson D, Perry C. Ertapenem: a review of its use in the management of bacterial infections. Drugs. 2003;63(17):1855-1878. Pfaller MA, Segreti J. Overview of the epidemiological profile and laboratory detection of extended-spectrum beta-lactamases. Clin Infect Dis. 2006;42(suppl 4):S153-S163. Critchley IA, Blosser-Middleton RS, Jones ME, Thornsberry C, Sahm DF, Karlowsky JA. Baseline study to determine in vitro activities of daptomycin against gram-positive pathogens isolated in the United States in 2000-2001. Antimicrob Agents Chemother. 2003(5);47:1689-1693. Nguyen M, Chung EP. Telithromycin: the first ketolide antimicrobial. Clin Ther. 2005;27(8):1144-1163. Chow JW, Satishchandran V, Snyder TA, Harvey CM, Friedland IR, Dinubile MJ. In vitro susceptibilities of aerobic and facultative gram-negative bacilli isolated from patients with intra-abdominal infections worldwide: the 2002 Study for Monitoring Antimicrobial Resistance Trends (SMART). Surg Infect (Larchmt). 2005(4);6:439-448. Nicolau DP. Spotlight on Clostridium difficile infection: an educational resource for pharmacists. Pharmacy Times. 2009;2:91-99. Brook I. Management of anaerobic infection. Expert Rev Anti Infect Ther. 2004;2(1):153-158. Livermore DM. Linezolid in vitro: mechanism and antibacterial spectrum. J Antimicrob Chemother. 2003;S1(suppl 2):ii9-ii16. Roberts S, Chambers S. Diagnosis and management of Staphylococcus aureus infections of the skin and soft tissue. Intern Med J. 2005;35 (suppl 2):S97-S105. Torres-Viera C, Dembry LM. Approaches to vancomycin-resistant enterococci. Curr Opin Infect Dis. 2004;17(6):541-547.
b Use a combination: for example, doxycycline with gentamicin or rifampin or doxycycline with trimethoprim-sulfamethoxazole and chloramphenicol. c Combination therapy with high eradication rates includes omeprazole + clarithromycin + amoxicillin; or bismuth subsalicylate + metronidazole + tetracycline. However, metronidazole resistance has risen significantly. d Up to 30% of Haemophilus influenzae strains are capable of producing β-lactamases. high-level penicillin resistance (MIC [minimum inhibitory concentration] >1 mcg/mL). The Centers for Disease Control and Prevention Drug-Resistant Streptococcus pneumoniae Therapeutic Working Group recommends MIC ≥4 mcg/mL for high-level resistance. The clinical significance of penicillin resistance in nonbacteremic patients is still uncertain when parenteral treatments are used. PRSP (penicillin-resistant Streptococcus pneumoniae) being defined as nonsusceptible to penicillin (PCN [penicillin] MIC ≥2 mcg/mL). For updates, see www.fda.gov/oc/opacom/hottopics/ bioterrorism.html. e Citrobacter spp. and Enterobacter spp. may differ in susceptibility patterns. Consult individual test results for appropriate choice. m Membranous pharyngitis treated with antitoxin and IV erythromycin (antimicrobials used to decrease toxin production and bacterial spread). n New classification: bacteria are gram-variable. Carbapenemase-producing Enterobacteriaceae are increasing, and are endemic in certain geographic regions. Viable treatment options are limited and should be based on susceptibilities. Generally, colistin/polymixin B and tigecycline offer in vitro susceptibility, although clinical data are limited. Combination therapy is encouraged. Van Bambeke F, Michot JM, Van Eldere J, Tulkens PM. Quinolones in 2005: an update. Clin Microbiol Infect. 2005;11(4):256-280. Erratum in: Clin Microbiol Infect. 2005;11(6):513. Yamaguchi T, Hashikita G, Takahashi S, Itabashi A, Yamazaki T, Maesaki S. In vitro activity of beta-lactams, macrolides, telithromycin, and fluoroquinolones against clinical isolates of Streptococcus pneumoniae: correlation between drug resistance and genetic characteristics. J Infect Chemother. 2005;11(5):262-264. Zhanel GG, Hisanaga TL, Laing NM, et al; NAUTICA Group. Antibiotic resistance in outpatient urinary isolates: final results from the North American Urinary Tract Infection Collaborative Alliance (NAUTICA). Int J Antimicrob Agents. 2005;26(5):380-388. Dr. Crandon reports no relevant conflicts of interest. Dr. Kuti has received research funding from and/or is on the speaker’s bureau and/or advisory board for Astellas, BioMerieux USA, Forest, Merck, Ortho-McNeil, and Pfizer. Dr. Nicolau has received research funding from and/or is on the speaker’s bureau and/or advisory board for AstraZeneca, Cerexa, Cubist, Forest, Johnson & Johnson, Merck, Ortho-McNeil, Pfizer, Rib-X, Tetraphase, and Vertex. Trampuz A, Zimmerli W. Antimicrobial agents in orthopaedic surgery: prophylaxis and treatment. Drugs. 2006;66(8):1089-1105. Resistance rates can vary greatly against P. aeruginosa, Acinetobacter spp., and the Enterobacteriaceae. Use as empiric therapy against these organisms should be based on local susceptibilities. Despite its potent in vitro activity against Streptococcus pneumoniae, daptomycin is not indicated for the treatment of pneumonia because it extensively binds to pulmonary surfactant resulting in clinical failure. The specific tetracycline recommended varies. For methicillin-resistant Staphylococcus aureus, minocycline is most active among class. Consult specific references. u These agents are generally recommended for urinary tract infections (UTIs) only. Use of the “1” to “3” scale refers to activity for treatment of UTI. v Vancomycin is considered first-line when IV therapy is required. However, ceftaroline, daptomycin, linezolid, telavancin, and tigecycline may be suitable alternatives in specified patients. Tetracyclines, clindamycin, trimethoprim-sulfamethoxazole, macrolides, and linezolid are viable alternatives when oral therapy can be used. In the face of erythromycin resistance, clindamycin should be considered only if the isolate is D-test–negative. w Vancomycin is considered first-line when IV therapy is required. Notably, in recent years vancomycin MICs have gradually increased for S. aureus and have included an increased occurrence of heteroresistance. Clinical reports have associated this loss of in vitro potency with vancomycin clinical failures in a number of patients. Alternative therapies—such as ceftaroline, daptomycin, linezolid, telavancin, and tigecycline—should be considered in the appropriate clinical setting. Consult specific references. x Effective choice for meningeal infections if the ceftriaxone/cefotaxime MIC <0.5 mcg/mL. can manage (once-daily treatments are preferred over more frequent administrations)? 3. Is the drug stable enough that it can be used in the outpatient setting? 4. How will the medication be delivered (gravity, elastomeric device, or electronic pump)? 5. How much training or nursing time will be needed and how many visits are required for this specific patient/treatment combination? There are many other questions beyond the 5 listed here. In summary, it is critical to the success of OPAT that the antibiotic chosen is the most efficacious against the particular bacteria identified. The reference chart provided in the educational review can be a vital tool for selecting the correct antibiotic for a given patient. Corp Co rpor oral al Gre eg Ca Caro ro on McMa Maho hon Publishi hiing, the publisher off thi h s news wspaper,, ws is spo p nsoring a fu fund n ra rais ise er for Cpl. Greg g Ca Caro ron. Cpl. Caron is an Ellingt gton on, Conn. Marine. He was injured ed in November in the lin ne of duty after stepp ppin ing g on an IE I D in Afg fgha hani nist ni stan an. He los ostt bo oth of his iss leg egss an nd a fing nger er, and also o broke his col olla larbone. We are ar e ra rais isin ing g fu funds to help Greg and d hi hiss fa fami mily mi ly as th they ey y fac ace ea very lon ong reco ove v ry. If you would like to help, please visit www.gr g eg gr egca ca aro ronf nfou f nd dat atio tio ion n.co n. com. If you wou ould like to donate, ple lea ase ma ail che heck ck cks ks to: Greg Caron on Foundation P.O P. O. Box 262 Ellingto to on, CT 06029 Checks can be made de e payable to: Greg Caron Family Fu Fund n Please indicate McMahon Publishing on the sub bjec je t line of your check ch che heck so the family knows where the donation cam am me from. P ase Ple se note, contr ntribu ibuti tio ons n to this fund are not tax-deduc uc ctib ti le. static prostate cancer treatment can cost $93,000, with a resulting life extension averaging 4 months. Malignant melanoma treatment employing ipilimumab (Yervoy, Bristol-Myers Squibb) costs as much as $120,000 for an estimated benefit of 3.5 months. Dasatinib (Sprycel, Bristol-Myers Squibb/Otsuka) is an oral chemotherapy medication taken daily for the treatment of chronic myelogenous leukemia; one month of treatment can cost over $10,000, and therapy is usually continued until disease progression or the development of unacceptable toxicity. Depending on the specific insurance plan, patient copayments may be derived from tiered drug levels or percentages of the total drug cost. While some patients have access to affordable insurance coverage, in many cases, the end result of copayments seems to have changed from one that prevents inappropriate medication use to one that prohibits the continuation of optimal patient care. Figure. Increasing cost of brand-name and generic drugs. Average sales price of the 219 most widely prescribed brand-name and generic drugs increased on average by 9.3%; this was the fastest growth rate in costs for brand-name drugs since 2002. CPI-U, Consumer Price Index for All Urban Consumers; NA, not available Based on references 3-5. To continue the treatment of patients on high-cost medications, including chemotherapy, health care professionals are increasingly turning to the aid of pharmaceutical manufacturer patient assistance programs (PAPs). PAPs provide brand-name medications at no cost or reduced cost to patients who meet specific program criteria, including income, prescription coverage, and residence. Oral, injectable, and infused medications are available through PAPs. For intravenous medications, there are programs that supply medications for use in an outpatient infusion clinic; there also are limited PAPs that replace medications used by uninsured patients during an inpatient admission (Table). PAPs, the turnaround time will vary. In some cases, it can be as quick as the same day, but most programs take from 5 business days to 6 weeks to process and receive medications. The downside of many of these programs is that the application process can be rather nebulous. Furthermore, as health care costs rise and these programs increase in number, it is likely that navigation of program loopholes will become more difficult, especially because a uniform application process does not exist. In some cases, application to a PAP can be initiated by the patient; however, action by the prescribing physician or the health care team is required to complete the application. While oncology practices would undoubtedly jump at the chance to provide the necessary therapy to their patients at a reduced and affordable cost, most have not yet created a systematic, organized approach to identifying the PAP that will provide the most assistance to each patient. Some oncology practices that have taken this step have identified a point person in the pharmacy department or have outsourced this role to a PAP manager to streamline the process. In many community oncology offices, a nurse has been assigned the responsibility of assisting patients with PAPs. In other cases, PAPs may be delegated to companies, such as McKesson and Cardinal, that run the program for a percentage of the reimbursed amount. Whatever the approach, heightened awareness of such programs is crucial for the optimal provision of treatment in the face of ever-rising health costs. Conclusion As drug development increasingly shifts to targeted therapies, response rates will continue to improve; but at the same time, health care costs will rise. The effect of current health care reform on the individual patient remains to be seen. It seems reasonable to assume that widespread and affordable access to vital drugs will not be secured by government agencies in the near future. It will remain the responsibility of the health care team to ensure that patients have access to the drugs they need for optimal treatment. PAPs can be a valuable tool to facilitate that access. 1. Kaiser Family Foundation. Family health premiums rise 3 percent to $13,770 in 2010, but workers’ share jumps 14 percent as firms shift cost burden. http://www.kff.org/ insurance/090210nr.cfm. Accessed November 15, 2011. 2. The costly war on cancer. New cancer drugs are technically impressive. But must they cost so much? The Economist. http://www.economist.com/node/18743951?story_id=18743951. Accessed November 15, 2011. 3. Medco R&D Directions. 2010 Drug Trend Report. http://www.drugtrend.com/art/drug_ trend/pdf/DT_Report_2010.pdf. Accessed November 28, 2011. 4. US Government Accountability Office. Report to Congressional Requesters. Brand-name prescription drug pricing. Lack of therapeutically equivalent drugs and limited competition may contribute to extraordinary price increases. http:// www.gao.gov/new.items/d10201.pdf. Accessed November 28, 2011. 5. US Department of Labor. Bureau of Labor Statistics. Consumer Price Index All Urban Consumers U.S. City Average, All Items 198284=100. ftp://ftp.bls.gov/pub/special.requests/ cpi/cpiai.txt. Accessed November 28, 2011. Visit our site to get a FREE ﬁnancial planning audio CD! Deborah Saine ASHP, January 1, 2009 Now in its second volume, this compilation offers in-depth information that expands beyond the five-minute pearls of wisdom to provide specific, practical advice on solutions from the perspective of pharmacists and technicians who are living with the realities of these medication use issues every day. Scan here for our complete catalog of medical books. ORDER ONLINE For pricing, a more complete review and easy ordering with a credit card, go to McMahonMedicalBooks.com. We can supply any medical book in print, so if you don’t find the book you want, email your request with billing information to RMcMahon@McMahonMed.com. If you are an author and would like your medical book featured in this book section, contact Ray McMahon, Publisher, at RMcMahon@McMahonMed.com. Raymond G. Hill Elsevier/Churchill Livingstone, February 21, 2012 The modern pharmacopeia has enormous power to alleviate disease, and owes its existence almost entirely to the work of the pharmaceutical industry. This book provides an introduction to the way the industry goes about the discovery and development of new drugs. Facts & Comparisons Lippincott Williams & Wilkins, October 17, 2011 The health care professional’s first choice for comprehensive, authoritative and timely drug information for more than 60 years. Drugs are divided into related therapeutic or pharmacologic groups for easy comparison. Lynette R. Bradley-Baker APhA, December 19, 2011 This book is designed to provide an easy and concise resource of relevant information for the new pharmacist graduate or newly promoted pharmacy manager. The information provides insights into issues that most pharmacy managers will face: human resources, financial, pharmacy law and patient confidentiality, business plan development and successful leadership. Profiles of pharmacy managers provide additional insight into what prepares, maintains and sustains a successful career in pharmacy management. Daniel L. Krinsky; Rosemary R. Berardi APhA, November 5, 2011 Thoroughly updated and revised, this book provides accessible information on nonprescription drug pharmacotherapy, nutritional supplements, medical foods, nondrug and preventive measures and complementary and alternative therapies. Through MedInfoNow’s customizable literature update service, you can now easily and efficiently stay up to date with the medical literature published in your field. Since 2001, more than 70,000 health care professionals have been receiving weekly custom emails that introduce and link them to specialty-specific journal article citations and abstracts published in Medline®, the premier index of biomedical literature, as well as reviews of important new books in their specialty. So make the power of the Internet work for you. Subscribe to MedInfoNow today. Clyde N. Cole; Stanley M. Shaw; Richard J. Kowalsky APhA, December 1, 2011 Built on nearly 50 tables and figures, this handbook provides essential facts and information used daily in nuclear pharmacy practice. A chapter on clinical applications of radiopharmaceuticals, organized by organ system, covers the most common uses of radiopharmaceuticals. READY TO USE. READY TO BUY. READY TO SELL. Amiodarone: the drug your customers know. And now, for the very ﬁrst time, it’s available from Baxter Healthcare Corporation in a manufacturer-prepared, ready-to-use, premixed form – the way your customers want it. S U I T A B L E F O R : S U R G E R Y C E N T ER S - EMS When you offer Nexterone, you offer a valuable drug with convenience. Premixed Nexterone eliminates admixing time when there’s not a second to waste. It also has a shelf life measured in years, not hours. And that means your customers can store it in crash carts until the instant it’s needed. * Your customers are ready for Nexterone. Are you ready to make it available to them? Contact your Baxter sales representative to ﬁnd out more. *Store in carton to protect from light until ready to use. Baxter, Galaxy, Nexterone and the Sphere Graphic are trademarks of Baxter International Inc.